절에 행사가 있을 때 절 입구에 당(幢)이라는 깃발을 달아두는데 이 깃발을 달아두는 장대를 당간(幢竿)이라 하며, 장대를 양쪽에서 지탱해 주는 두 기둥을 당간지주라 한다. 삼랑사터에 남아 있는 이 당간지주는 서로 멀리 떨어져 세워져 있어 두 기둥 가운데 하나만 원래의 자리에 남아있는 듯하다. 마주 보는 면의 바깥 면에 세로줄무늬를 도드라지게 새겼고, 꼭대기는 바깥쪽으로 곡선을 그리며 둥글게 내려가다가 한 단의 굴곡을 이루어 통일신라의 일반적인 모습을 보여주고 있다. 또한 중앙부분만 파여져 전체적으로 가늘어져 있다. 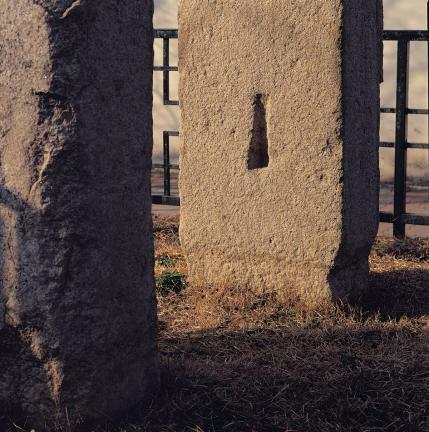 지주 안쪽 면에는 당간을 고정시키기 위한 홈을 아래위 두 군데에 파놓았다. 각 변의 길이가 적당하고, 높이와도 잘 조화되어 통일신라의 양식을 잘 따르고 있으면서도 중앙부분의 두께를 얇게 하는 등 장식에 신경을 쓰고 있다. A dang, or flag, was hung at the entrance of a temple. 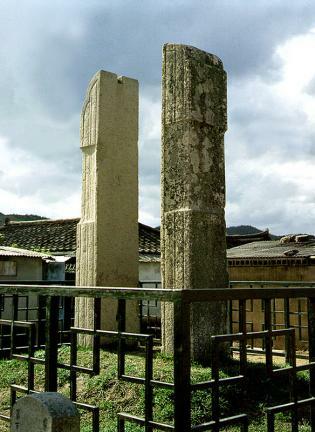 Danggan was the pole used to hold the flag for special occasions such as Buddhist ceremonies at the temple. 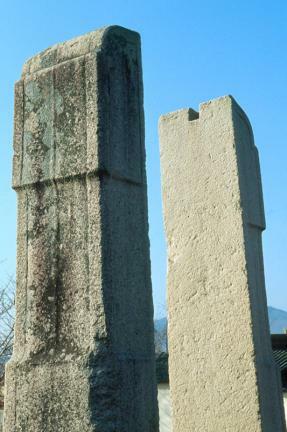 There are two stone supports for the pole, which is called Dangganjiju in Korean. 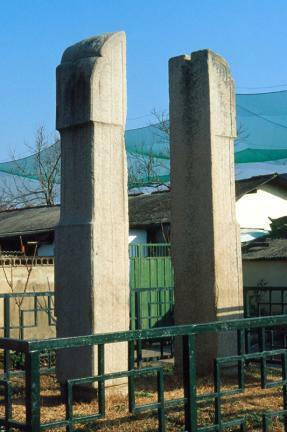 These flagpole supports, located at the site of Samnangsa Temple, are set up separately. Apparently, only one of these supports retained its original position during the construction. 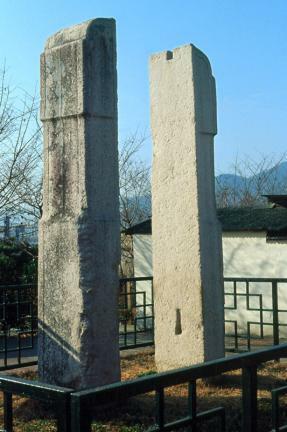 Each of the flagpole supports has a design inscribed vertically and in a clear-cut style on the outside, roundly running down to the outside from the top and subsequently forming one layer of curve as was the usual style of the Unified Silla Era. 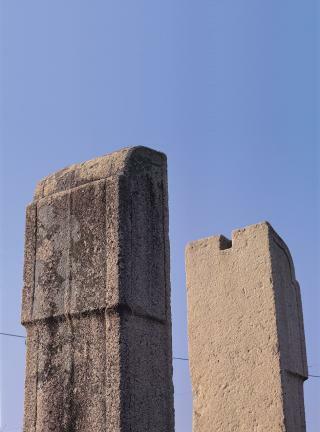 In addition, only the central parts of the supports are carved, which makes them thin. The inside of the supports has two holes for the flagpoles to be inserted at the top and lower parts. 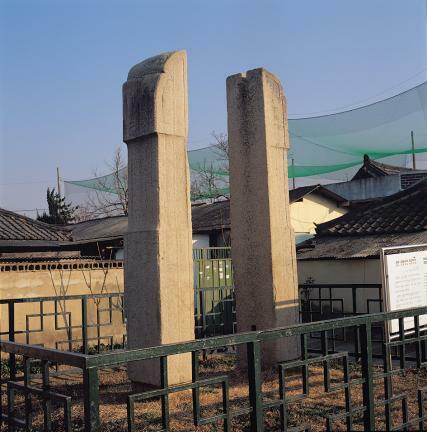 These supports followed the style of the Unified Silla Period, judging from the well-proportioned and well-balanced length of each side with the height; the thin central part of the supports also shows the careful attention paid to the decoration.